Microsoft Intune enables organizations to manage devices and applications. 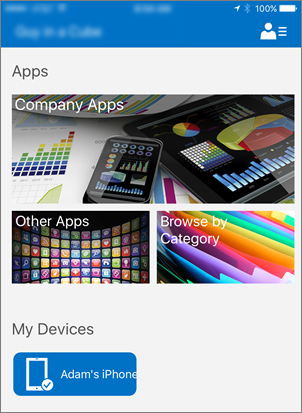 The Power BI mobile applications for iOS and Android integrate with Intune. This integration enables you to manage the application on your devices, and to control security. Through configuration policies, you can control items like requiring an access pin, how data is handled by the application, and even encrypting application data when the app is not in use. This article assumes that Intune is configured properly and you have devices enrolled with Intune. The article is not meant as a full configuration guide for Microsoft Intune. For more information on Intune, see What is Intune?. Microsoft Intune can co-exist with Mobile Device Management (MDM) within Office 365. If you're using MDM, the device will show enrolled within MDM, but is available to manage within Intune. After you configure Intune, background data refresh is turned off for the Power BI mobile app on your iOS or Android device. Power BI refreshes the data from the Power BI service on the web when you enter the app. 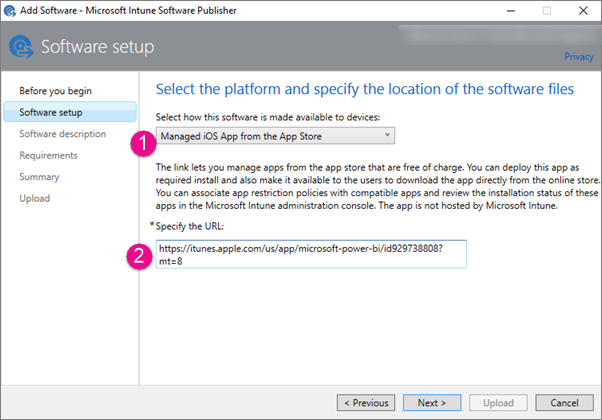 Before we create the application within Intune, we need to get the URLs for the apps. For iOS, we will get this from iTunes. For Android, you can get it from the Power BI mobile page. Save the URL, as you will need it when we create the application. To get the app URL for iOS, we will need to get it from iTunes. You should see Microsoft Power BI listed under iPhone Apps and iPad Apps. You can use either, as you will get the same URL. Select the Get drop down and select Copy Link. It should look similar to the following: https://itunes.apple.com/us/app/microsoft-power-bi/id929738808?mt=8. 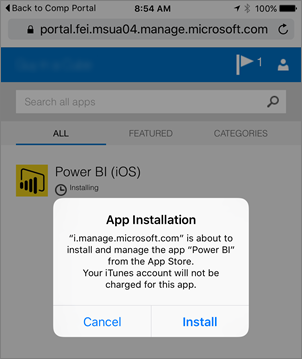 You can get the URL to Google Play from the Power BI mobile page. Select Download from Google Play to take you to the app page. You can copy the URL from the browser address bar. It should look similar to the following: https://play.google.com/store/apps/details?id=com.microsoft.powerbim. 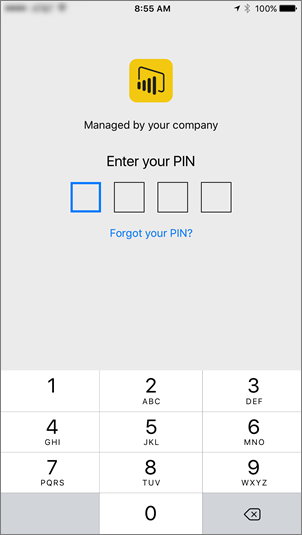 The mobile application management policy allows you to enforce items like an access pin. You can create one within the Intune portal. You can create the application, or the policy first. The order in which they are added doesn't matter. They will just need to both exist for the deploy step. 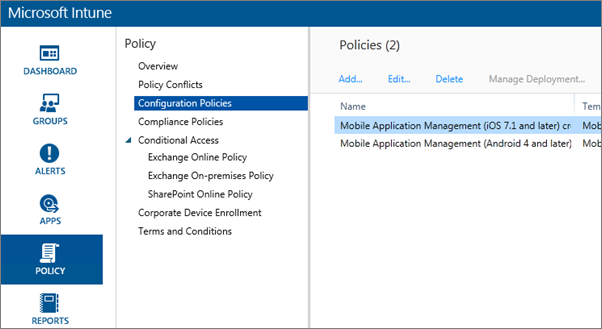 In the Intune portal, select Policy > Configuration Policies. Under Software you can select Mobile Application Management for either Android or iOS. To get started quickly, you can select Create a policy with the recommended settings, or you can create a custom policy. Edit the policy to configure the restrictions you want on the application. 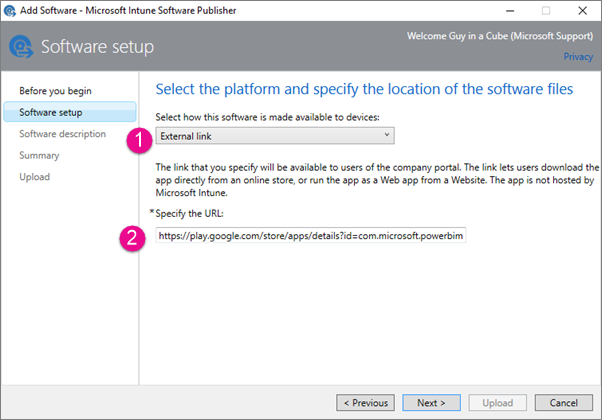 The application is a reference, or package, that is saved into Intune for deployment. We will need to create an application and reference the app URL that we got from either Google Play or iTunes. Go to the Intune portal and select Apps from the left menu. Select Add App. This will launch the Add Software application. Select Managed iOS App from the App Store from the drop down. Enter the app URL, that we got from Step 1, and select Next. Provide a Publisher, Name and Description. You can optionally provide an Icon. The Category is for the Company Portal app. Once you are done, select Next. You can decide if you want the publish the app as Any (default), iPad or iPhone. By default it will show Any and will work for both device types. 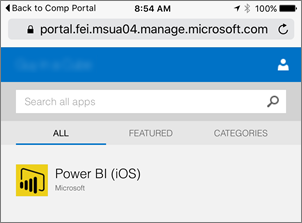 The Power BI app is the same URL for both iPhone and iPad. Select Next. If you don't see the app in the list, refresh the page: Go to Overview then back to Apps. Select External Link from the drop down. After you have added the application, you will need to deploy it so that it is available to your end users. This is the step where you will bind the policy you created with the app. On the apps screen, select the app you created. Then select the Manage Deployment... link. In the Select Groups screen, you can choose which groups you want to deploy this app to. Select Next. In the Deployment Action screen, you can choose how you want to deploy this app. Selecting Available Install, or Required Install, will make the app available in the Company Portal for users to install on-demand. After you are done making your selection, select Next. In the Mobile App Management screen, you can select the Mobile App Management policy that we created in Step 2. It will default to the policy you made, if that is the only iOS policy available. Select Next. In the VPN Profile screen, you can select a policy if you have one for your organization. It defaults to None. Select Next. In the Mobile App Configuration screen, you can select an App Configuration Policy if you created one. It defaults to None. This is not required. Select Finish. After you have deployed the app, it should show Yes for deployed, in the apps page. In the Mobile App Management screen, you can select the Mobile App Management policy that we created in Step 2. It will default to the policy you made, if that is the only Android policy available. Select Finish. You install the application through the Company Portal app. If you haven't installed the Company Portal, you can get it through the app store on either iOS or Android platforms. You will sign into the Company Portal with your organizational login. 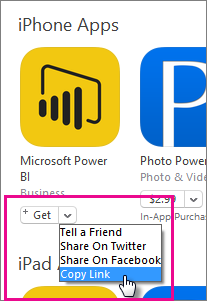 If you don't see the Power BI app listed as a featured app, select Company Apps. 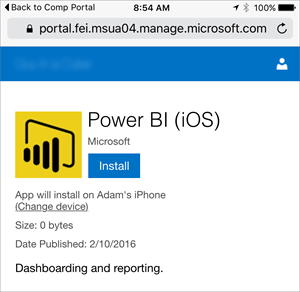 Select the Power BI app that you deployed. If you are on iOS, it will push the app to you. Select Install on the push dialog. After the app is installed, you will see that it is Managed by your company. If you enabled access with a pin, in the policy, you will see the following.